We have had a really busy term. It all started with pancake day. 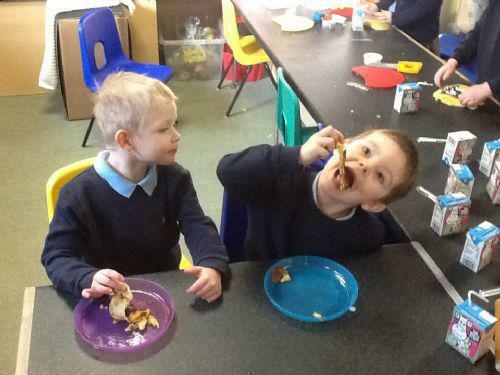 The children all tasted pancakes with various toppings. Chocolate was the favourite. We then learned a poem about mixing pancakes. 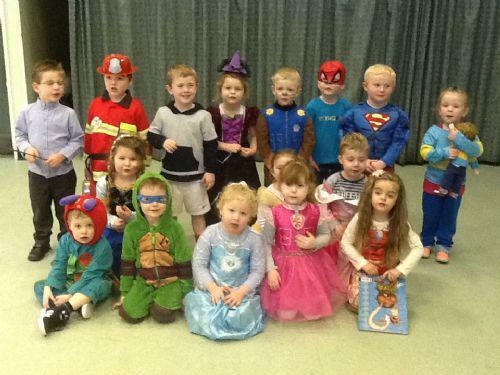 Then we all dressed up for world book day and enjoyed sharing our favourite books. We then had a very special delivery. "LIVING EGGS" We incubated twelve eggs in an incubatorand ten of them hatched into chicks (Not Dinosaurs). It was really amazing watching them peck their way out of the egg, it took a long time. The children were very gentle when handling the chicks. We weighed them and observed them through a magnifying glass. In Maths we have done lots of pattern work, counting and number recognition. We have been on a shape hunt around the school looking at the shapes in the environment. In our physical development we have been learning to move in a variety of ways around the room and across the floor. In Literacy we have been writing in our floor books, writing our names and practising using our pencils with the correct grip. We finished off the term with an Easter egg hunt and making Easter nest cakes. It really has been a busy term and we are all Super Heroes learning to focus, have a go, explore, make links and being proud of what we do.